What's the coolest thing about a royal wedding? It's not the dress — snooze — or the guest list — Victoria Beckham, really? — or the Senior British Correspondents all the American television networks trot out to bask in their expert analysis. It's the hats, stupid! The glorious, creative, towering, ridiculous, fancy, very very very pretty HATS. In this post, find out how to make a perfectly tolerable approximation of a feathered fascinator in the privacy of your own home, in just 84 easy steps. I've been making fascinators since one day in the summer of 2008 when I got really bored and decided to teach myself how to stick feathers onto things. I went on a bit of a fascinator spree that fall — I made one for my best friend in New Zealand, I made a bunch of them as holiday gifts, I think I even made one for Moe — and I wore my own heaps. Then I started seeing girls on the L wearing them, and then I saw fascinators for sale at Urban Outfitters, and I got kind of annoyed. (And then annoyed with myself for being annoyed, for being that person who's all like "I've been wearing fascinators since before they were cool, sigh.") So I went back to sewing, knitting, and plotting how I might one day make my own shoes. (Any pointers on that, email me.) 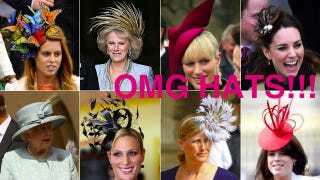 But fascinators are great! Because they're less formal than hats, they're versatile as accessories, and they're small, so they're quick and easy to make. Click any photo to enlarge. This is my new fascinator, which you too can make. Creating it was a fun thing to do with a rainy spring afternoon, and a nice excuse to drink liquor and listen to NPR! Ladies and gentlemen — to your crafting stations. For this project, you will need everything you see here. (And some things I forgot to put in the picture, oops! Namely, a needle and some dark-colored thread, an iron, an ironing board, very strong glue, and an awl.) Pictured are, clockwise from top: three strips of feather trim, in orange, green, and another green; one strip of longer feather trim; a roll of black silk organza; a pair of sewing scissors; a scrap of very long, wispy feather trim in deep green with red spines; a length of presentable-looking black elastic; and black fusible interfacing. This is what I started with, but it turned out that I only used a small fraction of the feathers, and only about 30cm square of the fabric. I had all of these things lying around (I find you never know when you'll need a piece of fusible interfacing or ten centimeters of feather trim, and also I hate throwing things away), but if you are running low in your supplies, you might consider stopping by a reputable notions store. If you live somewhere where your only craft retail (craftail? Cretail?) options are the benighted duo of Jo-Ann's and Michael's, know that the wonderland that is M&J Trimmings (where I bought these feathers, in '08 or so) maintains a great online store. Be careful: I can't so much as look at that stuff without spending fifty bucks, easy. This is my sketch. The general idea I started with was to make not a true fascinator per se, but a kind of elastic headband with a decorative swatch. The swatch, I decided, was to be circular, covered in feathers, with some kind of tuft of feathers emerging from the center. When I started, the exact dimensions/direction/density of feather coverage were all TBD. After highly scientific analysis of all the round things in my apartment that might serve as fascinator templates, it was determined that the catfood can was our best bet. First, we're going to assemble the little swatch that will anchor the elastic headband and form the basis of our feathered fascinator. The fascinator undercarriage, if you will. Trace and cut three precise catfood-can-sized circles in the fusible interfacing. Trace and cut two circles in the organza — I used organza, but you could use any dark colored, non-stretch, fairly light-weight fabric, like cotton sheeting or whatever — one rough but fairly close in size to the can, and one rough but a bit (ie one seam allowance) larger in diameter. Fuse that interfacing to the small organza circle. Fuse it really good. We want the undercarriage of our feathered fascinator to be rigid and stable. Fuse the second interfacing circle right on top of the first. I made sure the grain lines of my interfacing circles were exactly perpendicular, because I am obsessive-compulsive and the main focus of my disorder is crafts. Once the fascinator undercarriage has cooled, trim the excess organza around the edges. Find the center point of your circle by folding in half and in half again, and snip right up to that point. Because the human head is three-dimensional, we need to make our circle, our fascinator undercarriage, kind of domed, too. In a mirror, hold the thing up to your head, and overlap the newly cut edges until it's just right. Pin it, and use your needle and thread to baste it in place. Wrap your elastic around your head comfortably and securely. Cut the elastic to that length. Then pin the elastic to the fascinator undercarriage, try it on in front of the mirror, and reposition as necessary. I found that having the headband bisect the undercarriage just off the true mid point was desirable, because that way the fascinator sat a little bit back towards the top of my head. Once you have positioned everything to your satisfaction, baste the elastic securely to the fascinator undercarriage. You thought I'd forgotten that third circle of fusible I made you cut, didn't you! No dice. Snip to the center of the interfacing with the scissors, then fuse it to the underside of the newly joined headband-and-undercarriage, following its domed contours. Use a lot of steam and heat. Putting on this layer of interfacing will keep the ends of the elastic from fraying or shifting as we attach our feathers. True up the edges of the circle when cool. By the way, now is a really great time to queue up some music. And/or make a drink. This wee hat facilitated my catching up on three This American Lifes and one Radiolab. And I cannot speak highly enough of Julie Klausner's awesome podcast! You should be subscribing. Now, the feathers. This is where things get interesting, and where our fascinator starts to look like an actual fascinator, as opposed to a circle of interfacing sutured with uneven hand-stitches to a headband. Because I have never had a problem making things harder than they need be, I decided to pluck feathers individually from the ribbon base, and to strip the spines of their down. I thus made feathers with a a good, clean centimeter of spine at the base and then an inch-and-a-half-or-so long plume in a nice even green color. See! Feathers like this. That's what I wanted. Maybe you can buy these somewhere, ready-made? I don't know. I plucked, stripped and snipped. On the left, all my prepped feathers. On the right, the feather stubs I was left with. I couldn't think of anything to do with them (stuff a very small and uncomfortable pillow?) so I had to throw them away. Which I hate. Now, let's get down to business! Take your fascinator undercarriage, and take a few feathers. Line them up about a centimeter or so in from the perimeter. Adjust as you see fit. You want the feathers to extend about a half an inch past the edge of the undercarriage. Far enough so as to hide it from sight, but not so far that your fascinator gets really big. Once you know where your spines are going to be attached, more or less, spread some really strong glue all over there. If you can have one hand be your glue hand and one hand be your feather-touching hand, that's probably a good idea. Stick the feathers into the glue, one by one, in batches of four or five at a time. Overlap the feathers for good coverage. Then, tack each feather onto the fascinator undercarriage. I used backstitches, two stitches per feather, one in the plume, one on the spine. Whenever my fingertips got too gummy with glue, I squirted them with a few drops of tea tree oil-olive oil-castor oil mixture (I think any kind of oil or Goo Gone would serve the same de-congealing purpose). Then I scrubbed the glue off. Then I dipped my hands into a finger bowl of soapy water. And dried them. Voilà! Work all the way around, until you finish a full circle. That's row one. Awesome. You deserve a(nother) drink! Don't worry, row two goes much faster. Now the bare section in the center is so small, we're ready to do the tufted bit. This is the fun part. (I mean, aside from all the other fun parts! Aren't you having FUN?) Grab some of your longer feathers and put on your fascinator and go to town checking how you wanna position your central tuft. I decided I wanted my tuft pointing to the side and back. Using your awl, make some big holes in the center of the fascinator undercarriage. Be careful! My mum was a teacher of blind and visually impaired children, and she frequently reminds me that Louis Braille was blinded in a terrible awl accident. (Infection cost Louis the sight in his second eye.) He later used that very awl to invent braille. Big holes, left, get filled with feather spines, right. Try not to bend the spines as you push them through. Although I liked the long, red-spined feathers, I thought the contrast between them and my green fascinator base was too much. So I plucked some green, wispy feathers from my long feather trim, stripped the downy bits near their bases, and trimmed their spines. Poke them through the awl holes. I kept on adding feathers until something about the composition looked right to me. On the reverse side, I sewed in and around the cluster of feather spines. Pretty tightly, but not super tightly; I didn't want to pierce any of the spines, lest I weaken them. So I just sort of wrapped my thread around, a bit like I was making a button stem, and then sewed back and forth through the fascinator undercarriage until it felt secure. Next, trim the spines of the tufted feathers, and on the wrong side, douse the whole damn thing with strong glue. So here's our fascinator! It's almost done. (Definitely make another drink at this point, because if you wait any longer you might not finish all of it before you run out of craft.) All this project needs is another four or five of the little feathers, sewn in at the very center to cover the last of the organza and interfacing. Use the same method as before — two backstitches, one above the line of the plume and one on the spine — and overlap the feathers as you work your way around. I did not use glue to hold them in place before sewing, because I didn't want it to be visible, but upon reflection it probably doesn't make a difference. If your tufted feathers point off to one side like mine do, then you won't have to bother stitching little feathers on to that side — the tufted feathers alone will camouflage both the exposed fabric of the fascinator undercarriage and the spines of the feathers in row two. You remember that big circle of organza? That's our lining. Sew it all around the perimeter of the fascinator undercarriage. That way nobody will have to know how messy your stitches are from the wrong side. (Guess I just told the whole Internet about mine! Never mind.) If you wanted to be really cool, you could probably use a colorful lining. I love any article of clothing or accessory that has a fancy lining almost reflexively. Like, I have this one second-hand frame purse that has a lining, and the lining is printed to look like fake wood. How cool is that? Or, does anyone remember that episode of The Fresh Prince Of Bel-Air where Will starts a fashion for turning Bel-Air Academy uniform blazer inside out, because the lining happens to be bright purple paisley? (Note: this is impossible with school uniforms in real life. Administrators anticipate precisely that kind of off-label use.) And Carson gets really annoyed at Will's failure to respect the solemnity of the uniform? If you've thought to do something like that, you're probably an awesome person. Me, I'm stuck with the organza because I was already halfway through sewing it when I remembered a fancy lining is more fun. I'm a sucker like that. Okay! We're done! So pull on a proper dress, pour a big drink, and hold a little impromptu solo dance party in front of your closet. Woo! And when the time comes, pretend you're invited to Westminster Abbey. Your head gear at least deserves to be there.